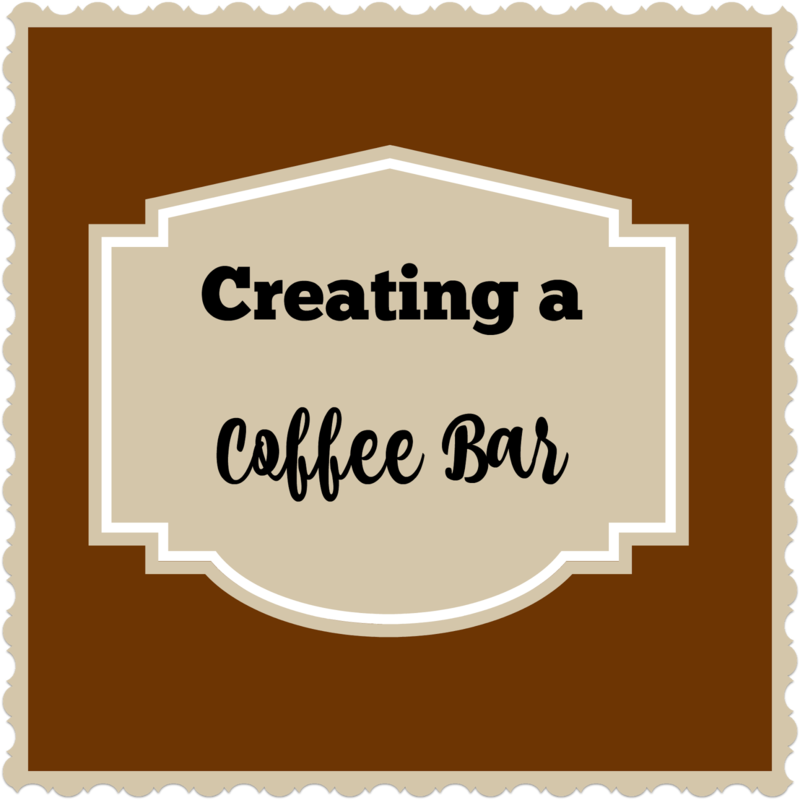 I've been seeing pictures of coffee bars on Pinterest and have always wanted to do something similar in our house. 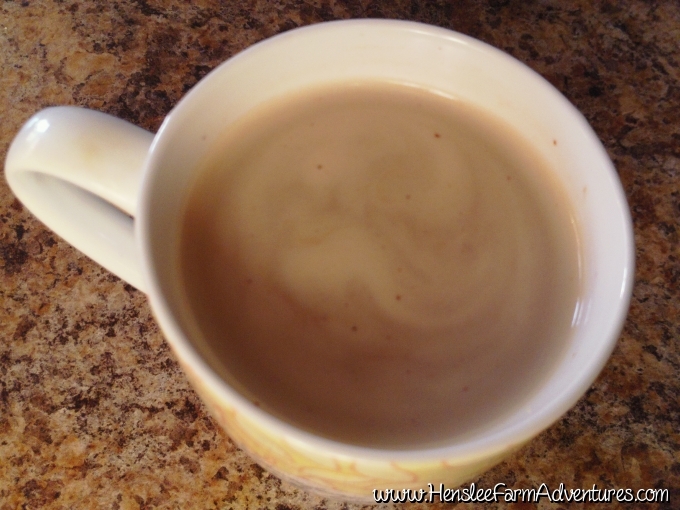 Coffee is a pretty important beverage in our house, with the only things that come before coffee is Jesus and family! 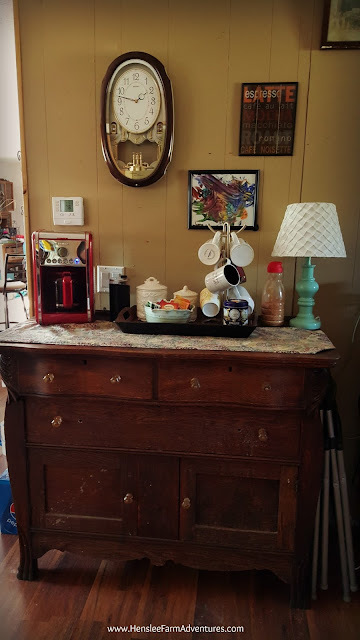 I was able to acquire an old antique buffet from my grandfather. I believe that it belonged to my great-grandmother and she used it as a buffet. When my grandfather had it, he used it as storage for his tools in his little wood shop. After both of my grandparents had passed away, it came to me (because really no one else wanted it). 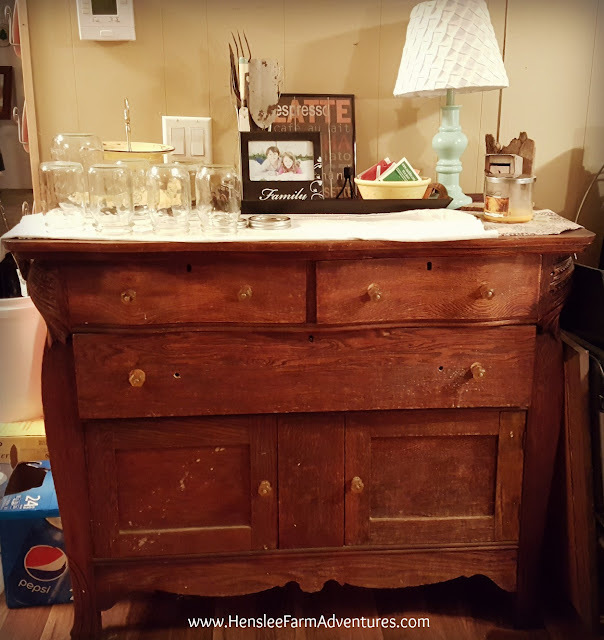 Even though I loved it and thought it was beautiful, it was dirty and the drawers had oil spilled in them, the doors were falling off and it smelled to high heaven! It took several years for me to get that smell out of the drawers. I scrubbed it on a monthly basis and put fabric sheets in it. I honestly thought that the oil would never come out and the smell would always be there. I almost gave up hope on ever being able to use it. When I did start using it, it first became storage for my then toddler son's underwear and socks which I put in the top drawers and books in the bottom part where the doors are. When we moved to the home we currently live in, I thought that we didn't really have room for it. I let my niece use it as a kitchen island which was so cute! She took the one remaining door off and put baskets below. She put utensils in the drawers. I was happy that it was being put to good use and staying in the family. However, she moved and was not able to take it with her, so I took it back and decided to make room for it. It was actually perfect because I needed storage for my grandmother's china that I inherited from her. I was able to put the buffet right off the kitchen and put the china in the bottom part, table cloths and other holiday themed items in the middle drawer, and tea towels and dish cloths in the two upper drawers. I just set some decorative items on top to make it look pretty. Although if you look at the picture above, it just pretty much looks cluttered! What really spurred me on to create the coffee bar was when our coffee pot died one morning not too long ago. We were looking to buy another coffee pot, but it had to be something that my husband and I both liked, but didn't take up too much room since I had it sitting near the sink and my baking station. I thought that moving it to this buffet and making it a coffee bar would give me more room to bake (yay!) and also allow me to keep all the coffee and tea items together. I told my husband about it and showed him some pictures on Pinterest. He loved the idea! It also allowed us to purchase a coffee pot that was function, fun, and funky! Here is our coffee bar. The only thing new in this picture is the coffee pot. The canisters, which sorry I didn't get a close up picture of, say coffee on one and tea on the other. I also have a cup stand that was given to me by my mom all sitting in a tray that my husband bought for me. You can't see it very well, but I also have my coffee bean grinder that was a gift from my sister several Christmases ago. And of course next to the lamp is my homemade spice tea mix. To get the recipe for that click HERE. 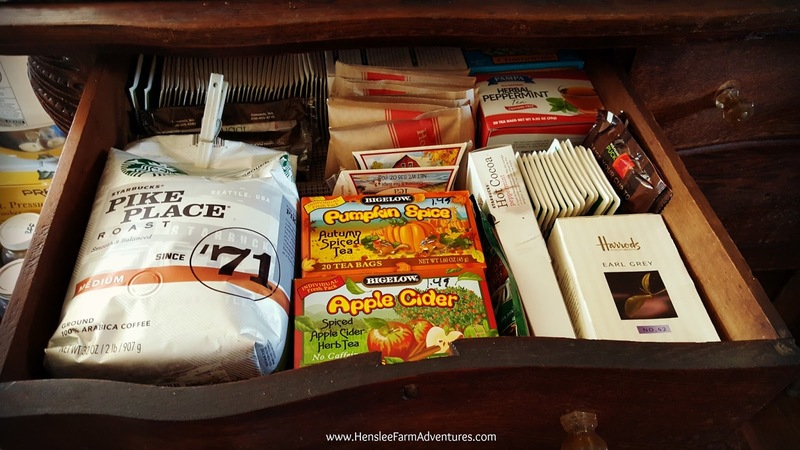 I also cleaned out one of the top drawers and was able to put coffee, tea, and hot chocolate in it so it would be easily accessible. Everything is right at hand. We love our new coffee bar! My husband said that his was one of my better ideas and I am so glad that we carved out a little space and reused things that we already had to be able to create this. I am sure as we use this it will evolve into an even more organized space that our family will love and use. Think you can't have a coffee bar? That's what I thought, but start looking at your space in a different light. Start imagining how things would look in different places. And there is no reason why you can't carve out a little space for yourself. If you have already created a coffee bar, then please tell me about it in the comments below! Or let me know what you think of our space!